Do you have something about your smile that you’d like to change? Perhaps you’ve suffered an injury or let unhealthy habits change the way your teeth or mouth look. Whatever your issue or reason, our cosmetic dentistry team here at Euclid Dental Center is here to help. As the region’s premier cosmetic dentistry providers, we utilize our decades of combined experience and the industry’s latest technology to bring our patients a host of cutting-edge cosmetic dentistry procedures and extraordinary results every time. When you want the best for your teeth and mouth, there is no better team to work with than our cosmetic dentistry professionals here at Euclid Dental Center. Our dentists, Dr. Amy Zonoozi, DDS, and Dr. Niki Katoozi, DDS, work with you to build a plan around your ideal smile. Patient safety and satisfaction are our top priorities, and we work diligently to ensure that these priorities are met at every step of treatment. Many of today’s leading cosmetic dental procedures are made possible through recent advances in dental technology. At Euclid Dental Center, we’ve invested in the industry’s latest equipment to bring these advances to our patients. We understand how important your smile is to your confidence and health, which is why we go the extra mile to provide you with the latest cosmetic treatments and services. These tooth-colored fillings can restore the shape and appearance of mild to moderately misshapen teeth. Our in-office and in-home teeth whitening treatments can safely and effective remove years of stains and discoloration within minutes. Special thin laminates are bonded over the front of the teeth to restore strength and appearance. Our process involves the use of a tooth-colored material to improve the color of a tooth, or close unsightly gaps. 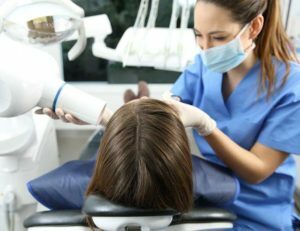 Or dental technicians use state-of-the-art cosmetic tools to correct crooked, chipped, cracked, and even overlapping teeth quickly and painlessly. Crowns are synthetic caps placed over the top misshapen teeth to restore their size, shape and appearance. This small procedure is performed to reshape gums and bone tissue, and often used to correct a “gummy” smile. Bridges literally bridge the gap created by one or more missing teeth. A bridge is made up of two or more crowns for the teeth on either side of the gap. Our specialty dentures are made from a combination of metals and synthetic material such as acrylic resin to mimic the look and feel or natural teeth. We provide gum lifts and soft tissue grafts can be used to even gum lines and cover exposed roots. We perform bone grafts to surgically correct severe gum disease, cover exposed roots, stop bone loss and gum recession. Our soft tissue grafts can also be used to replace lost gum tissue. Permanent, durable and aesthetically pleasing, dental implants are surgically placed in the area of a missing tooth to mimic its function and appearance. Zirconium is becoming one of the most chosen materials for dental crowns. Due to its many advantages which include: Extraordinarily tough, similar to natural teeth, less tooth removal, no metal fuse, and biocompatible. Composite fills are completed with a restorative material that contains 30-50% less resin than many other composite brands. Less resin means a reduction in the presence of trace amounts of bisphenols. The composite filling used in our office does not contain any Bisphenol A or B. The composite material used by Dr. Amy and Dr. Niki tests high for biocompatibility among patients. Euclid Dental Center in Ontario, CA, offers a full array of dental services to help you maintain healthy teeth.